Watching Rob Zombie’s 2007 Halloween re-imagining, it was impossible not to detect the pungent odour of frustrated flop-sweat emanating from the disjointed final product. While the first half of the film was a continuation of the gonzo hillbilly exploitation themes of the director’s schlocky-but-promising debut House of 1000 Corpses and its sick-in-the-head brilliant sequel The Devil’s Rejects, the latter portion felt like a reigned-in and creatively bloodless retread of Carpenter’s 1977 original. 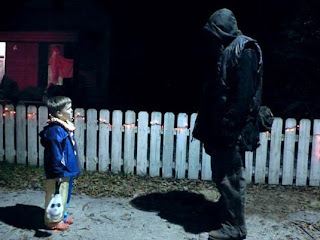 The result was a movie more laughably bad than scary, with the buck wild-lunacy of the Zombie-influenced early scenes of Michael Myers childhood utterly destroying the suspense of his climactic Haddonfield, IL. home-town murder spree. 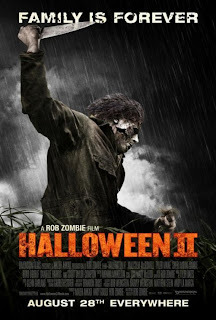 Now, with Halloween II, Zombie appears to have been let off the leash, free to explore his own obsessions and eccentricities to the fullest without having to adhere to the mythology of the earlier entries. Indeed, with this film the director seems to seeking, feverishly and gracelessly, to transcend the entire Slasher flick genre and create an unsettling quasi-artistic minded study in post-traumatic suffering, evidenced by the juxtaposed mental decay of Michael Myers (Tyler Mane), now tormented by hallucinations of his deceased mother (Sheri Moon Zombie) and his younger self (Chase Wright Vanek), and his chief victim Laurie Strode (Taylor Scout-Compton), a scarred and emotionally rattled teenager battling schizophrenic visions and night terrors. This is unexplored territory in the franchise and, in theory at least, a fresh and intriguing approach to very creaky material. 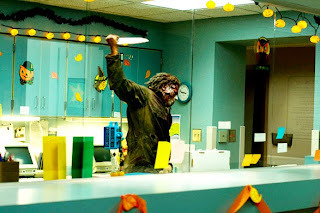 Sadly, however, Halloween II is an unwatchable slop-bucket of a film, filled to its grimy brim with incoherent editing, grainy, ugly cinematography, wretched performances and tensionless brutality. If there is a worse film looming ahead in 2009, I weep for the future. Set mere minutes after the first film, wherein Laurie had blown most of Michael’s skull to paste with a revolver, we pick up with the blood-soaked, trembling girl being consoled by Sherriff Lee Brackett (Brad Dourif) and put throug h gruesome post-attack surgery (one of the film’s oh-so-rare neat touches), while the skull-smashed slasher is taken away in an ambulance driven by an inept pair of medics who ponder the finer points of necrophilia. After the vehicle is destroyed in a car-on-cow calamity, Michael escapes and pulls a Kwai Chang Caine, nomadically wandering the earth on foot (and growing a nifty beard in the process). In his Halloween: H20 review back in 1998, Roger Ebert queried how Michael survived between homicidal rampages. Well, Zombie shows us: he whiles away his time butchering obnoxious rednecks and devouring their dogs raw. Nice. As Myers slowly winds his way back home in time for October 31st, Laurie must confront the cause of her fractured psyche and prepare for another blood-drenched holiday. 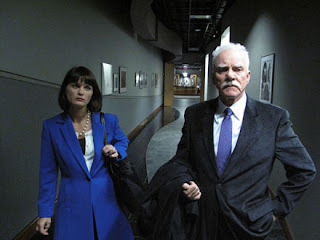 Zombie has shown in the past a bitter spitefulness towards his critics and has this time found a mouthpiece for his aggravations in Dr. Loomis (Malcolm McDowell), M yers’ former psychologist who, having survived a vicious assault in the previous film, has become the glory-seeking author of an opportunistic expose of Michael’s eviscerating exploits. As the director’s film spins frantically away from him into a numbing black hole of unintelligible Marilyn Manson video-esque dream sequences - not to mention an aggravating extended cheat which recalls 1981’s own Halloween II - and misplaced 70s nostalgia (a black-and-white live performance of 10cc’s “The Things We Do For Love” apparently gets lots of airplay in Haddonfield), Loomis hurls insulting barbs regarding “journalists” and even resentfully yells that “I don’t think you understand what I’m trying to do here!”. Oh, we get it Rob, but it stinks. Despite the movie’s lofty aims, all drama is sucked out of Halloween II by its tin-eared dialogue (Do kids really say things like “too coolio for schoolio” and “I’m starvin’ like Marvin”?) and feeble lead performances. While a bored McDowell often seems to be cha nnelling his obnoxious Tank Girl villain, Scout-Compton, perhaps the shrillest Scream Queen ever, wildly overplays every scene, succumbing to endless fits of headache-inducing hysteria by the third act. A scene featuring a fateful revelation has the potential for true disquieting horror, but instead the actress thrashes around like a grounded mackerel and shrieks the F-word in endless succession. By the time we get to the overwrought climactic showdown in a dilapidated shack we yearn desperately for gunfire if only to silence the grinding cacophony of ear-splitting sound-effects and banshee-like screeching. Sitting through Halloween II is a punishingly dull experience, where even the ferocious kills feel exhausted and mundane. In attempting to m ould the series into a pretentious weirdo experiment Zombie has delivered a true fiasco which, fingers crossed, will inspire him to regroup and rediscover the sly wit and stylishness which made him such an electric talent in the first place. 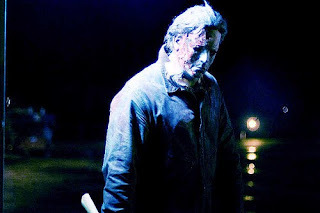 For the only mark Halloween II seems destined to leave is a greasy stain on theatre screens across the world. *Originally printed in SFU's The Peak: Sept. 7th, 2009.